When it's a weekend that's so boring you cry out, "I'm losing my marbles," then it's high time that you practice what you preach and risk losing them. Or, even better, if you're losing your marbles, there's a chance you might regain them - and that with interest - by phoning a like-minded friend. Ensure that your mate doesn't show up with his worst marbles while you gamble away your best. That's hardly a fair bet. In fact, if you know your friend well enough and he rocks up with less than half grade marbles - when in reality you know he has much better marbles - then don't proceed with the next steps. 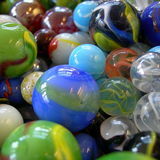 Of course, if all marbles will be returned at the end of the game, it doesn't matter what marbles are used. Take turns doing the following. You select a marble (preferably a tommy marble) and place it on the floor. Floorboards are ideal for this game but carpet shouldn't be a problem. Your buddy sits down about a metre and a half away. He opens his tin, selects the first marble, places it on the floor, aims, and using his thumb, flicks it in the direction of your marble. Whenever he misses the target, those marbles become yours; whenever his marble hits yours - it's no longer yours. Just like any gambling, this marble game can be a lot of addictive, adrenaline pumping fun. Gamble responsibly. I suggest calling it quits after three or four unsuccessful attempts. And there should be integrity in sportsmanship. In order words, no match fixing. If you know the precise location of gradients in your house, or if there's going to be an earth tremor at the time you play marbles, or if you have secret knowledge of the Force, or if a demon in a specific corner of the house is going to pre-empt the direction of your marbles (or an angel may assist your friend just to humble you), don't use such things to your advantage.